This story was updated at 2 a.m. 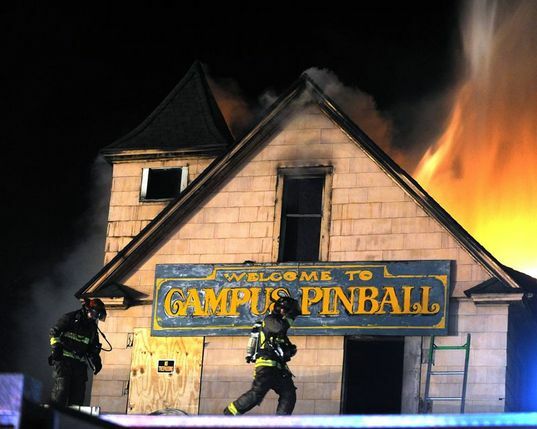 The vacant Pinball Pete's near the University of Michigan campus was destroyed tonight in a large blaze that forced evacuations and drew a massive crowd. 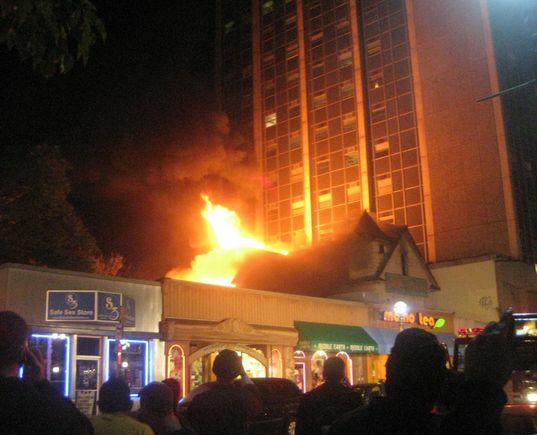 The fire was reported at about 10:13 p.m., and flames were still visible until about 12:40 a.m. in the area of South University Avenue and Church Street. Ann Arbor Assistant Fire Chief Ed Dziubinski said when firefighters arrived after receiving several 911 calls, they found flames shooting from the back side of the University Towers. Dziubinski said the Pinball Pete's building was vacant and hadn't had gas or electric service for some time. The roof of Pinball Pete's collapsed, and aerial trucks from several fire departments were being used to spray water on the blaze. At times, water bounced off the structures and into the large crowd, which cheered in response. Dziubinski said the cause of the blaze isn't know, and no injuries have been reported. Fire investigators and police detectives were inside the building at about 2 a.m. to begin investigating how the fire started. 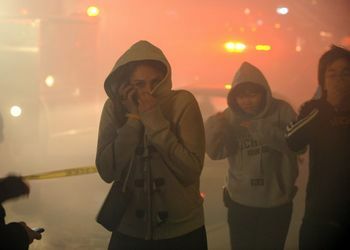 The large fire forced evacuations of nearby buildings, including the high-rise University Towers. Dziubinski said more than 600 U-M students were evacuated, and four apartments had heavy smoke and water damage. U-M junior Carlene Zhang, 19, lives in University Towers and said she was in her room on the fifth floor when a friend came to alert her that Pinball Pete's was on fire. She and others said several floors of University Towers were filled with smoke. Steve Thompson, who lives on the 11th floor of University Towers, said he heard fire trucks arriving just before the fire alarms activated in the building. He described the evacuation as calm and orderly. "By the time we got outside, it seemed like they had a good response, and it wasn't an inferno or anything," he said. By 1:20 a.m., fire officials were letting some residents back inside the towers. University housing officials and the Washtenaw County chapter of the American Red Cross also responded to the scene to assist students and residents. South University Avenue from Church to Forest streets was blocked off. About 45 firefighters were on the scene and were expected to be there most of the night, officials said. Aaron Hein and his fiancee drove to the scene from their home on the city's west side after hearing about the fire from a friend. Hein worked at Pinball Pete's in 1998. The two said the building was an important landmark for them. They watched the blaze for more than an hour, and Hein's fiancee cried as flames shot from both sides of the structure. "It's sad to watch a piece of my childhood go," Hein said. - Reporting at the scene by David Jesse and Stefanie Murray; written by Amalie Nash. 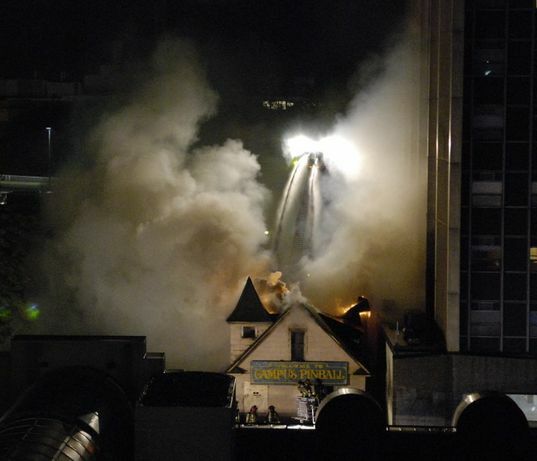 If you have photos, videos or information about the fire, you can e-mail us at news@annarbor.com. • Flick slideshow by Christiane Evaskis. University of Michigan students cover up from the smoke that was pouring down South University Avenue. 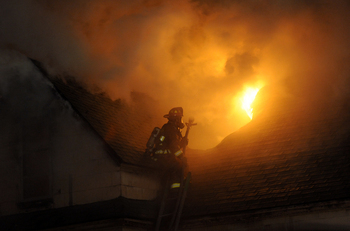 An Ann Arbor firefighter tries to get close to the flames shooting out of the roof. Ann Arbor firefighters walk along the roofline of the old Campus Pinball building on South University Avenue in downtown Ann Arbor.